A newly-opened coffee shop on Temple University’s campus has curiously decided to base part of its brand around a sign that reads, “Up All Night on Adderall,” referencing the drug used to treat ADHD that is frequently abused by students on college campuses. Common Grounds, which opened for business at 16th Street and Cecil B. Moore Avenue on Sept. 19, is helmed by 2005 Temple grad Shawn Bullard and 2002 Penn State grad Stephen Yaeger, according to a story from the Temple News. That same article mentioned the Adderall sign in the first sentence and shows the sign in the photo at the top of the story, but Bullard or Yaeger never address why they chose to display it in the shop. Gillian McGoldrick, Editor in Chief of the Temple News, told PhillyVoice the student newspaper has an opinion story budgeted about the sign. The sign is featured prominently in the Common Grounds' Instagram posts. The business doesn’t have a traditional website, meaning the Instagram account seems to be its primary marketing platform, though the shop does have a Yelp page. Common Grounds responded to a PhillyVoice request for comment on Wednesday with this statement: "By any means we do not and are not promoting drug abuse." As of Oct. 16, the sign is fully identifiable in seven of the shop’s 70 Instagram posts, and at least partially visible in seven others. Adderall – a prescription amphetamine with effects similar to cocaine and that can be addictive – is commonly found on college campuses being used, and abused, for non-prescribed purposes: staying up late to study, or to party. According to The National Center for Health Research, the frequency of Adderall abuse fluctuates between schools and can be as low as 1 in 12 across a student body, or as high as 1 in 3 students. It says Adderall users are more susceptible to extreme risks like hallucinations, cardiac arrest, or even death for people with heart conditions when they use the drug without a prescription or at higher-than-recommended dosages. Jillian Bauer-Reese, assistant professor of journalism at Temple, tweeted her disapproval with the sign at Common Grounds after it was brought to her attention Tuesday. When she first saw Temple student Sarah Madaus reference the sign online, Bauer-Reese said, she thought it would be far less permanent than a glowing neon sign. "I used to work at a few restaurants," Bauer-Reese told PhillyVoice on Tuesday, "and so I thought it was a chalkboard joke, something temporary that they’d realize was offensive and take down. But then I realized they paid — I don’t know how much those signs cost – but they paid a substantial amount of money to mount something permanent on their wall." Madaus said she was immediately off-put by the message being sent. "The sign rubbed me the wrong way because, whether intentional or not, it glorifies substance use/abuse," Madaus told PhillyVoice via Twitter. "It's literally glowing!" Madaus said she understands, objectively, why Common Grounds would use the sign as a marketing tool for college students, considering they're often the ones using the drug. And according to the Center on Addiction, a 2016 national survey found that 38.5 percent of college-age individuals (19 to 22 years old) believed regularly taking Adderall for non-medical purposes did not pose a “great risk of harm." Considering the attitudes around Adderall that are already present on college campuses, Madaus doesn't think using the sign is appropriate. "There are people very close to me that struggle with drug use and others that abuse Adderall," Madaus said, "and I think it’s in very poor taste to make light of what is a very real struggle for many students." Madaus said there are other students on campus who feel the same way. At one point, she considered starting a petition for Common Grounds to take the sign down. Bauer-Reese, who is also the faculty adviser for the collegiate recovery group on Temple's campus, saw even more wrong with the sign. "For one thing, it makes a joke out of substance misuse on college campuses, in the midst of a national addiction crisis," she said. "Secondly, it minimizes the importance of medication on which so many people with ADHD depend. "And the third, final, most disturbing problem is, it’s tone deaf to the racial and class disparities in our city, especially in neighborhoods with college campuses. As a college student, you can drink a $7 latte under a sign that says, 'Up all night on Adderall,' but up the street cops will bust you for using drugs or similar low-level offenses." The numbers illustrate this effect on Temple's campus. 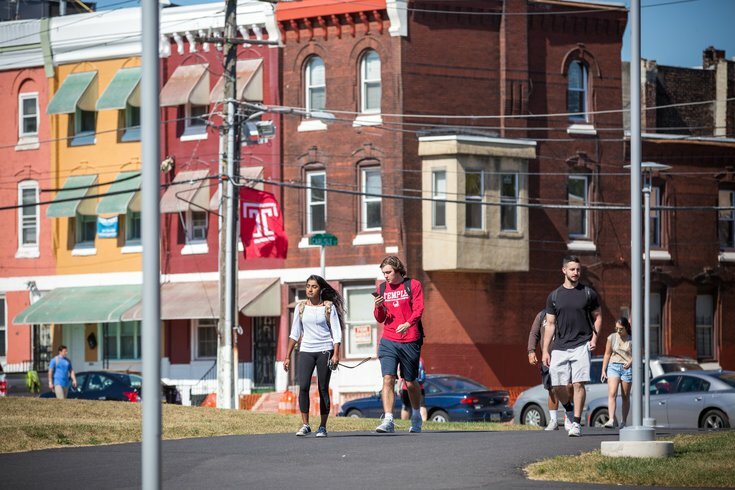 As Ryan Briggs pointed out in a recent story at The Appeal, just 2.2 percent of alcohol and drug-related incidents that occurred on Temple's campus or in Temple student buildings resulted in arrests. On the streets surrounding Temple, 50 percent of alcohol and drug incidents resulted in arrests by campus police. Whichever problem sticks out the most, it's clear the sign doesn't sit well with everyone on campus, especially when its connection to the product is so tenuous. "The sign could have said anything else," Madaus said.